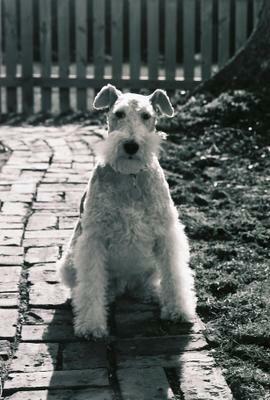 Dianne and Dave would like to thank those who sent their thoughts, prayers, and good wishes to them about Angel Arlo. They really appreciated them. 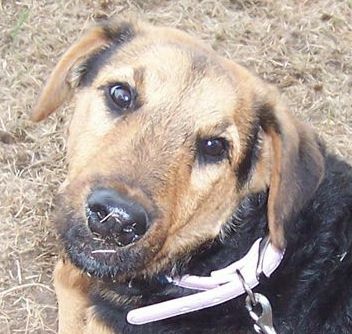 Dianne also said in her e-mail to "Tell the hoomans to give their furbabies an extra hug, kiss, and belly rub for us!" (so be ready you guys, I was just almost strangled by my mum). 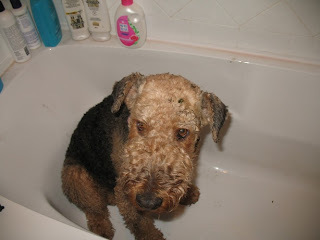 D & D now share their life with Arlo's rescue Airedale brother, Woody, and their new addition - a rescue Wired Fox Terror who REEEEEEALY opened their eyes....hehe, but they love him to bits!! Remember this picture from the "Wet suit + REJECTED" post? Now to the cards, I got 10 more from Friday and today!!!! and LOOK, it's a card with the booootiful Faya on it. 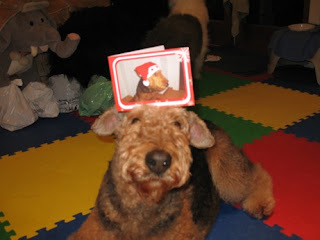 I liked it so much I even balanced the card on my head!!! 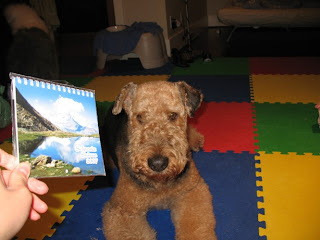 Along with the card was a calendar of the boootiful landscape of Switzerland. Faya said it's a little piece of home she's giving me so that everytime I look at it, I would remember her in Switzerland. THANK YOU SO MUCH Faya & Veronique, that was so sweet of you!! I am so happy to have met you too! Here is me with all the cards I got from Friday and today. 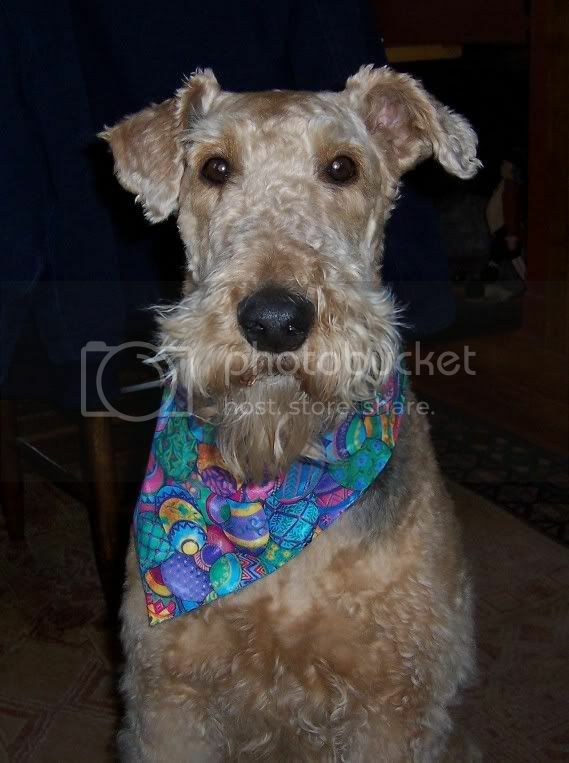 Notice the cute bandanna that I was wearing with little red bones on it? That's my pressie from Jay!! 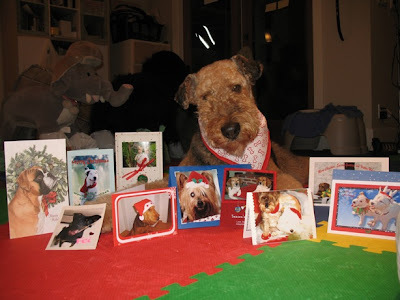 The cards were from: Cubby and his sister Dakota, Fei, Scuba, Buster, Faya, Jay, Miss Nugget, Jesse & Jake, The daschies, and JaffeBoy & KaylieGirl!! 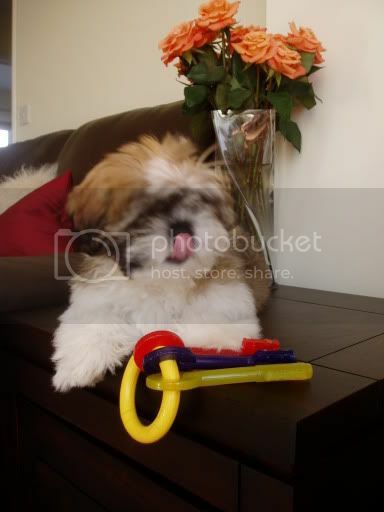 They are all so well designed and put together, and we LOVE all the cute pictures of the pups. Thanks guys!! YUP, that's the way it came. 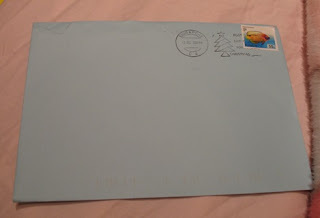 No recipient address label (I'm sure it must have fallen off during sorting). 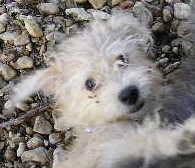 However, on the back, there is the cute picture of Scuba on the address label. We met our mailman a few days ago on our walk and he asked ME (not mum) "are you the SuperDALE that everybody is writing to??" 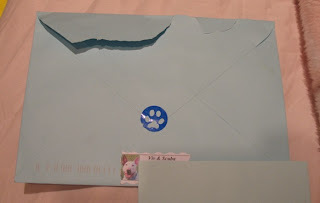 So our well trained mailman knew this address-less card must be for Miss Sunshade the SuperDALE!!! FYI: even tho the mailman knows me now, in the future, it is still a good idea to put down my address if you want to send me something. OK?? Ho ho ho, my very own stocking!!! He is the cutest moosie EVER, and he has bells attached to his ears. Hmmmmm..... I wonder what those bells are for?? And I, always get my way!!! PS. can you believe the THING is still alive?? It's kinda broken tho because it won't shut up even when you turn it off. So it meows and purrs in the middle of the night for no reason. It doesn't even need anything to trigger it, it just meows on it's own... Mum says it's kinda creepy, but I just think it's so annoying so I usually just go upstairs to sleep and leave mum downstairs with it. 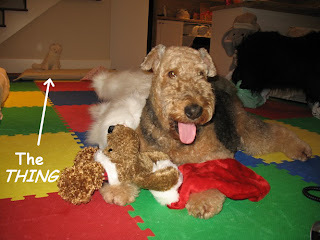 Oh, and that Airedale stocking you see on the right hand side of the mantel? 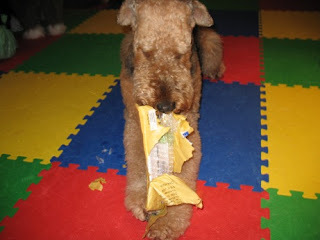 It was mine, until I saw the new singing moosie, so I have generously allowed mum to have the Airedale one. I am such a thoughtful dogter!!! You are SO SO lucky to get a christmas stocking! I don't have one, yet. I'm sure that my mom (or my hooman siblings) will see to it that there is one hanging for me very soon. I have been really good, after all. I've come out of hiding, at least for now. My mailman came to meet me too! He knocked on our door and asked to meet Murphey the Dog, that's me! He said I got more cards than anybody he delivered to, cool. 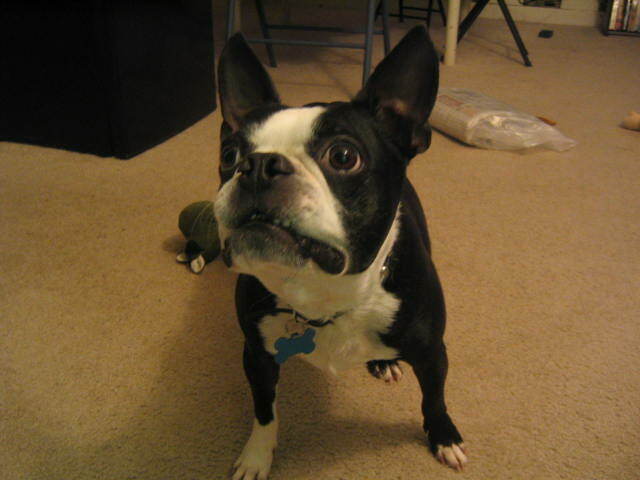 I only barked at him once and didn't even try to jump on him. I love your new moosie stocking! It's you! And what a sweet girl you are to share with mom. Just 2 more weeks before Christmas and you are scoring points with Santa! Good girl Sunshade! 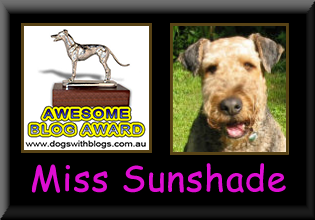 Miss Sunshade - Now all our mailmen will know us after the X-mas card exchange! That is, in a good way. 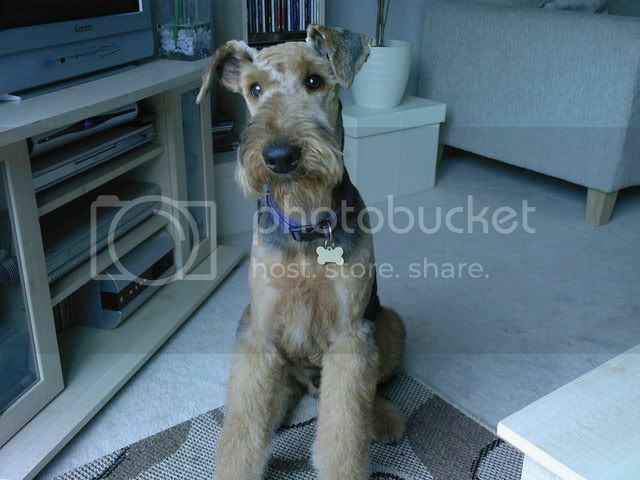 Your moosie looks a little bit like an airedale don't you think? At least in the jaw). Can you pretend it's a dale? 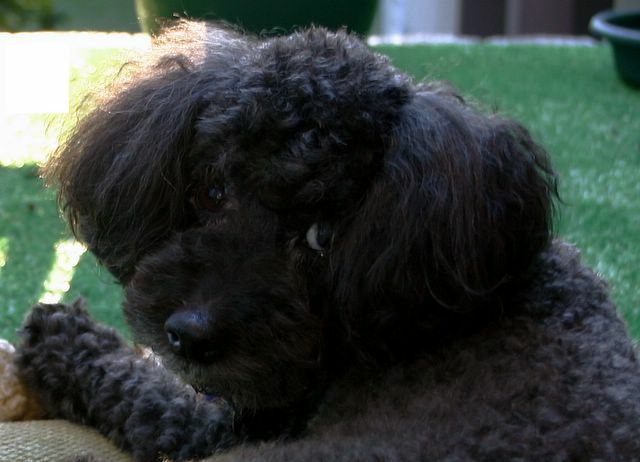 Sunshade, you're the most famous dog in Vancouver!! Does that mean the next time I send you something, I don't even have to write your address on it?? Hehehe. 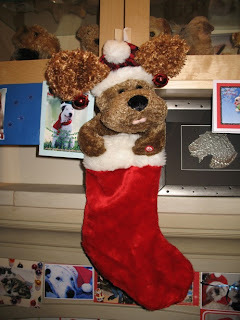 As for the talking/moving stocking, Mommy thinks its the cutest thing! 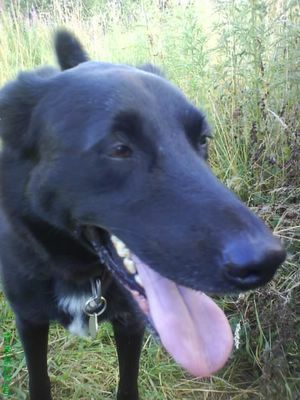 Hey Miss Sunshade, I am back from Clink (or Kennel Hotel Withoug Internet Access!) so its taking time to catch up. Your blog is looking cool and you are so darn cute. ps the post lady here in Scotland asked Jeannie why there were so many cards for me.....and when Jeannie started to tell her, she began backing away from her down the drive. She now thinks Jeannie is one crazy lady.....and gives her a wide berth each time she sees us! 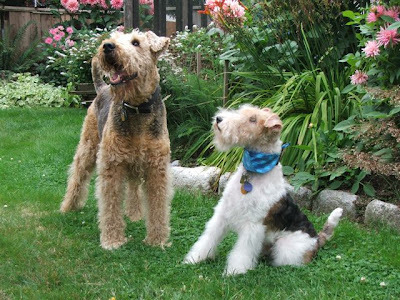 Man, Woody & Dickens sure are cute doggies! 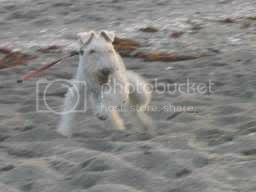 That is so nice that they rescued a little wire fox terrier too! Goosey poop huh??? hehehehehe! Did it ever come out of your hair?? Bet your Mummy loved scrubbing that stuff. We just LOVE your stocking! Ya know our Mama collects Moose things. Be sure not to rip him up, Santa needs to put your prezzies inside of the stocking. That moose looks a little bit like you Sunshie - the same brown fur. Wow those you-mans got a me!!!!!!!!! Poor you-mans!!!!!!! Wow Miss Sunshde - a card without even an address...you ARE famous! 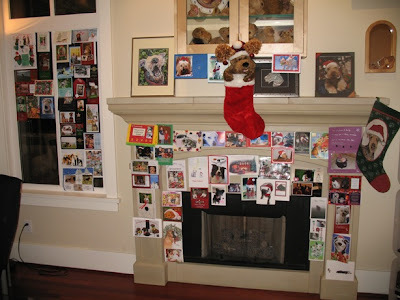 How cool!I'llhave to get my mom to take a photo of our Christmas cards too..its so funny to see all those that have come for me and hte 4 that have come for Mom an dad!heheheheh! BTW- love the pic of the WFT and ADT together....just as God intended! hehehhehe! You sing WAAAAAY better than the moose in the stocking .. no wonder you killed him!!! oh sunshade, why are you holding back your ears all the time? you are famous! luckily you are otherwise, scuba's card will never reach you and the postman is still wondering the card is for who!!! Goose Poops! Oh now..what a double whamy. We love your stockings. So cute! And how come that thing is still alive? My name was ALMOST woody, but then they picked Joey. See my dad's middle name is Woodrow. Your stocking is SO cool! You are so nice to share your other one with your mom. Oh and GOOSE POOP SO GROSS. wait, what is a goose? Your stocking is cool, but it doesn't seem like it would fit lots of presents in it. Are you sure you did the right thing giving the other one to mum? You like goose poop. I prefer fox poop myself! 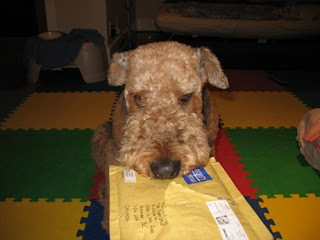 How well trained is your mailman! Keep an eye on the thing, it might steal your stocking. My human brothers have stockings, why don't I have one? Mummy!! I love the goose poop story, hee, hee! Your stocking is really neat! I don't have a moose in mine *sigh* *YELLS, Momma I want a moose in my stocking! * I hope you get my card soon! It should be there any day now!